In this tutorial, we build an RDF(S) document that is introduced in RDF Primer by using MR3 . There are two ways to build RDF(S) documents by using MR3 . One is a top down method. In the top down method, the users firstly build RDFS contents and then build RDF contents by using classes and properties defined in the RDFS contents. The users can also use an existing RDFS document by importing the document into MR3 . The other is a bottom up method. In the bottom up method. the users can create RDFS classes and properties when they build RDF contents by using RDF(S) contents management facilities. In this tutorial, we introduce how to build up the RDF(S) document shown below using top down and bottom up methods. You can also check how to build the RDF(S) document from the videos page in the MR3 web site. At the begininng, the users should register prefixes and the corresponding namespaces in the [Namespace Table] to build the RDF(S) document. The [Namespace Table] can be shown by selecting icon in the toolbar or selecting [Namespace Table] sub menu in the [Window] menu. Fig. 53 shows the correspondence between the namespace prefixes and the namespaces shown below registered in the [Namespace Table]. The namespace prefixes mr3, rdf, rdfs and owl are registered in the initial state. When the users input a prefix in the [Prefix] text field, input a namespace in the [NameSpace] textfield, and select [Add] button, they are registered in the [Namespace Table]. Prefixes and namespaces can be used to create resources (RDF resources, RDF properties, RDFS classes, and RDFS properties). In this step, we insert foaf:Person class in the Class editor. First, when the users click a right mouse button in the Class Editor, a popup menu is shown (Fig. 54). An RDFS class can be iserted by selecting [Insert Class] menu in the popup menu. In the example RDF(S) document, foaf:Person class is the type of bob:me resource. 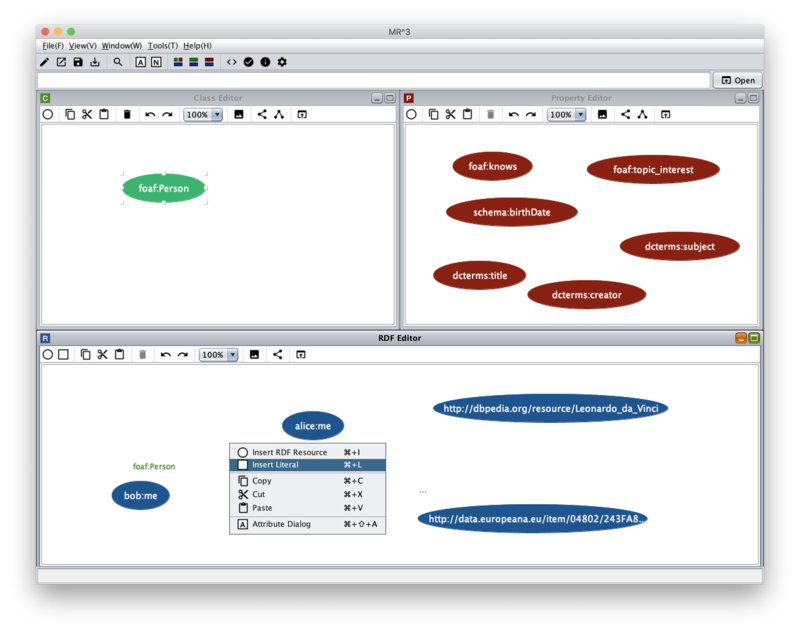 In MR3 , a type of an RDF resource can be selected from classes in the Class editor. Therefore, in order to select the type of the RDF resource, foaf:Person class must be defined before creating the RDF resource by the top down method. After selecting [Insert Class] menu, [Insert Class] dialog is shown (Fig. 55). The RDFS class (foaf:Person) is inserted by selecting foaf prefix from the [Prefix] combobox, inputting Person in the [ID] text field, and selecting the [OK] button. In this step, insert RDFS properties in the example RDF(S) document (foaf:knows, schema:birthDate, foaf:topic_interest, dcterms:title, dcterms:creator, dcterms:subject). When the users click a right mouse button in the Property Editor, a popup menu is shown. After selecting [Insert Proerty] menu, the [Insert Property] dialog is shown (Fig. 56). An RDFS property is inserted by selecting a prefix from the [Prefix] combobox, inputting id in the [ID] text field, and selecting the [OK] button. 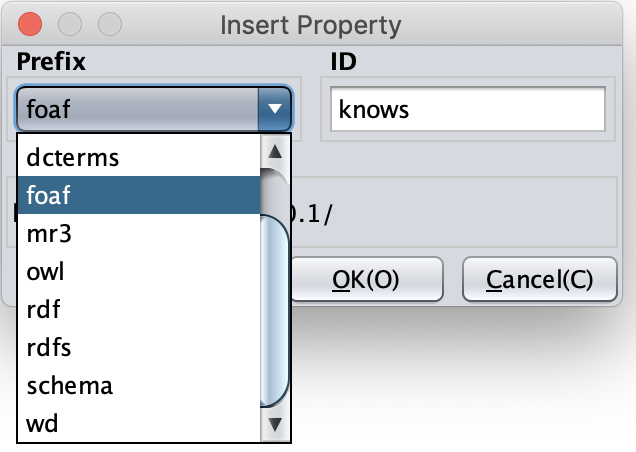 In MR3 , an RDF property can be selected from the properties in the Property Editor. Therefore in order to select an RDF property, the corresponding RDFS property must be defined before using the RDF property by the top down method. Fig. 56 shows a dialog when the users insert foaf:knows property in the Property Editor. Fig. 57 shows a screenshot after inserting foaf:Person class in the Class Editor, and foaf:knows, schema:birthDate, foaf:topic_interest, dcterms:title, dcterms:creator, dcterms:subject properties in the Property Editor. In the following steps, we build RDF contents based on the RDFS class and the RDFS properties built by above steps. 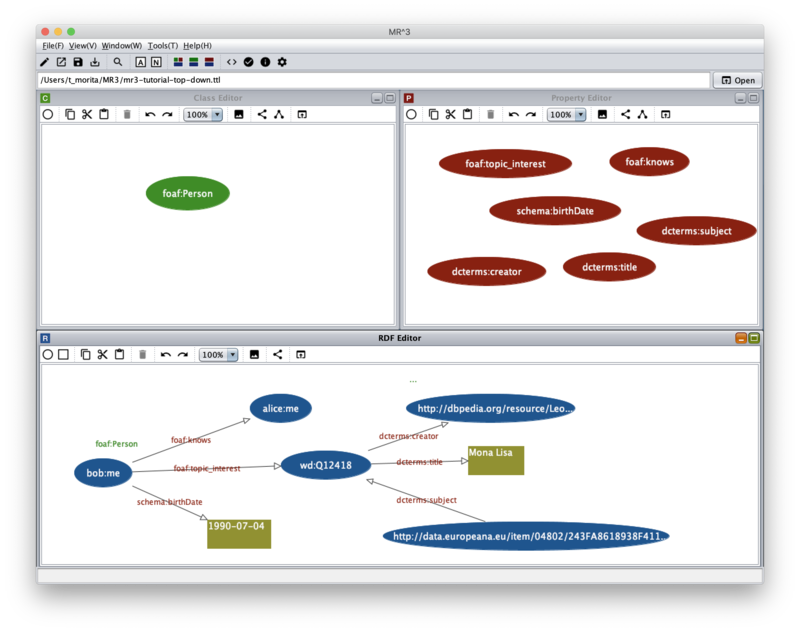 First, insert an RDF resource in the RDF Editor. 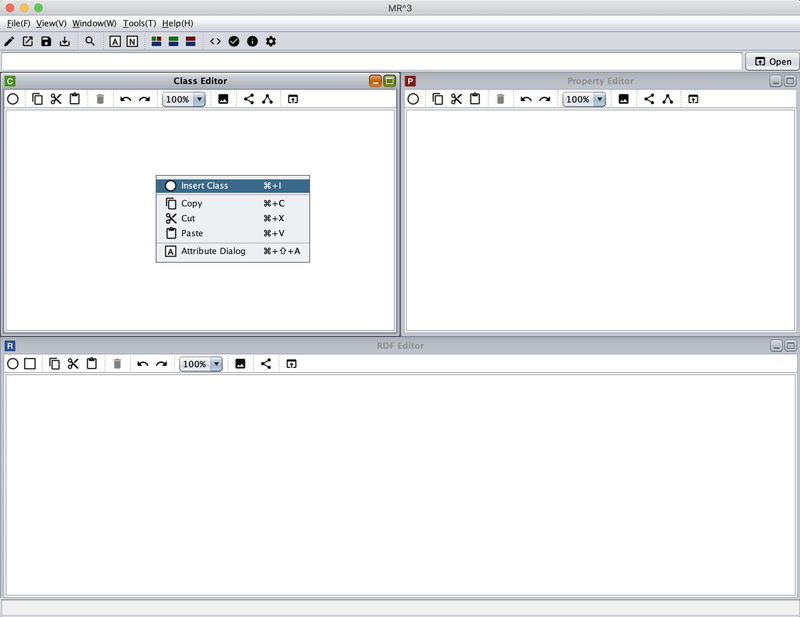 When the users click a right mouse button in the RDF Editor, a popup menu is shown. Fig. 58 shows a screenshot showing the popup menu. After selecting [Insert RDF Resource] menu, the [Insert RDF Resource] dialog is shown (Fig. 59). 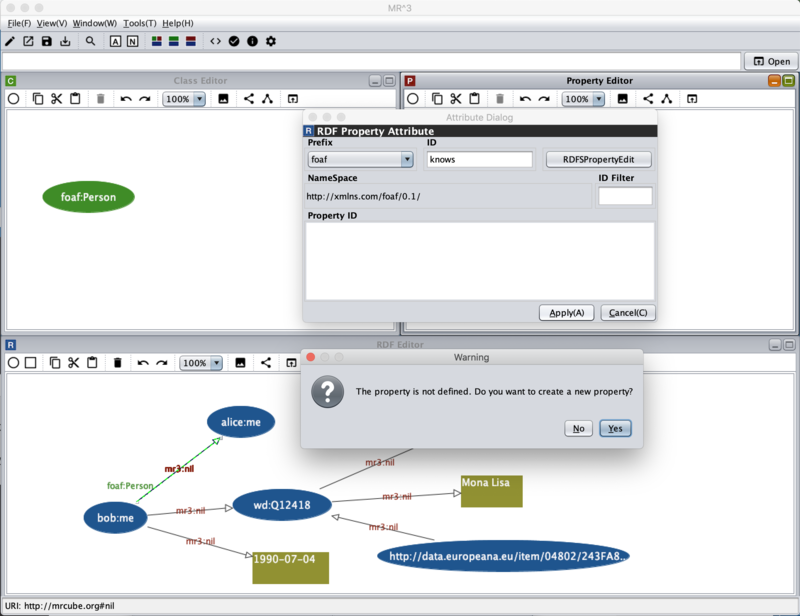 A type of an RDF resource can be selected from [Resource Type] combobox. Types of RDF resources can be selected from RDFS classes in the Class Editor. Here, select foaf:Person class as a type of an RDF resource. Then, input http://example.org/bob#me in the [RDF Resource] text field. The RDF resource is inserted after selecting the type of the RDF resource, inputting the URI of the RDF resource, and select the [OK] button. In the same way, insert alice:me, wd:Q12418, http://dbpedia.org/resource/Leonardo_da_Vinci, http://data.europeana.eu/item/04802/243FA8618938F4117025F17A8B813C5F9AA4D619 as RDF resources in the RDF Editor. Select empty as the type of resources. In this step, insert “1990-07-04”^^xsd:date と “Mona Lisa” RDF literals in the RDF Editor. When the users click a right mouse button in the RDF Editor and select [Insert Literal] menu in the popup menu (Fig. 60), the [Insert Literal] dialog is shown. Fig. 61 shows the [Insert Literal] dialog. An RDF literal is inserted after inputting strings in the [Literal] text area and selecting [OK] button. When the users check the [Data type] checkbox, a data type of a literal can be selected from the [Data type[ combobox. 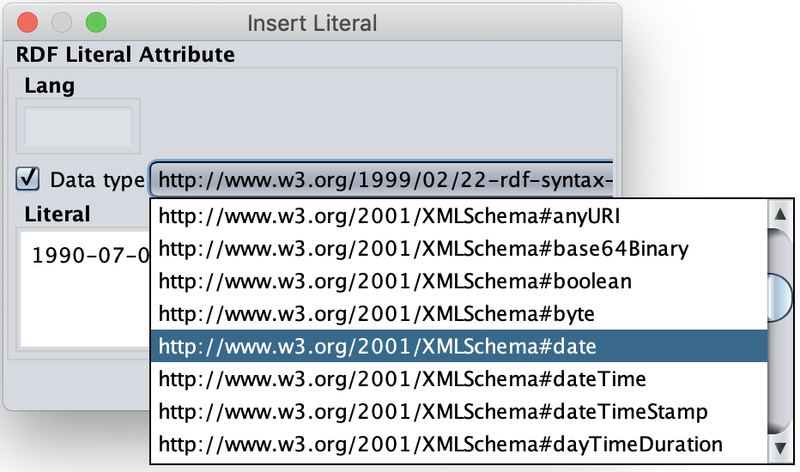 Here, select http://www.w3.org/2001/XMLSchema#date (xsd:date) as the data type of “1990-07-04” literal. In this step, insert RDF properties in the RDF Editor. First, move the mouse cursor to the center of a source (subject) RDF resource. At that time, the shape of mouse cursor changes from arrow to cross. After that, drag the mouse cursor to the center of a target (object) RDF resource or RDF literal. When the shape of mouse cursor changes from arrow to cross, drop the mouse cursor. 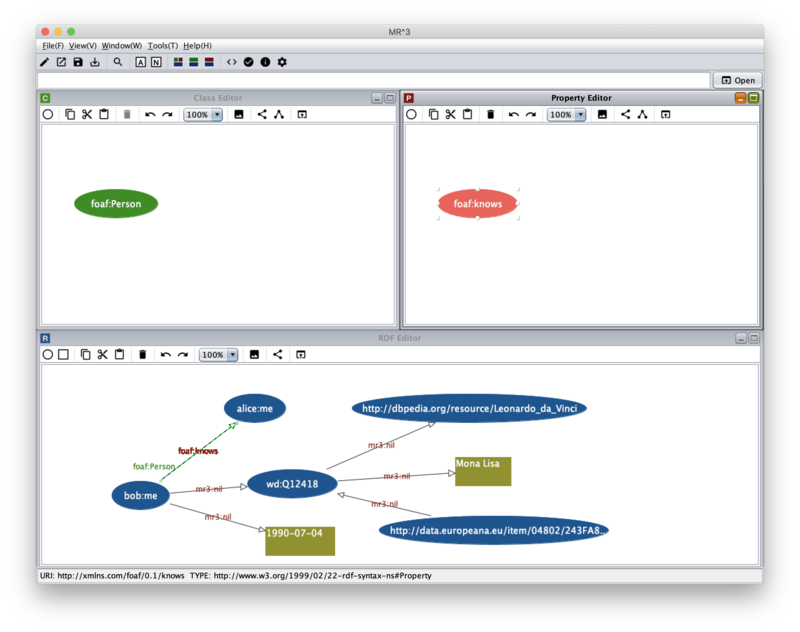 Then, two nodes are connected with an RDF property. If the users do not select one of the RDFS properties in the Property Editor, the RDF property becomes mr3:nil which is the default RDF property in MR3 . If the users select one of the RDFS properties, the selected RDFS property is used for the RDF property. Here, connect bob:me RDF resource and alice:me RDF resource with foaf:knows RDF property. Fig. 62 shows the screenshot of connecting these nodes. In the same way，connect bob:me RDF resourcre and “1990-07-04” literal with schema:birthDate property. Connect bob:me RDF resource and wd:Q12418 RDF resource with foaf:topic_interest property. Connect wd:Q12418 RDF resource and http://dbpedia.org/resource/Leonardo_da_Vinci RDF resource with dcterms:creator property. Connect wd:Q12418 RDF resource and “Mona Lisa” literal with dcterms:title property. http://data.europeana.eu/item/04802/243FA8618938F4117025F17A8B813C5F9AA4D619 RDF resource and wd:Q12418 RDF resource with dcterms:subject property. 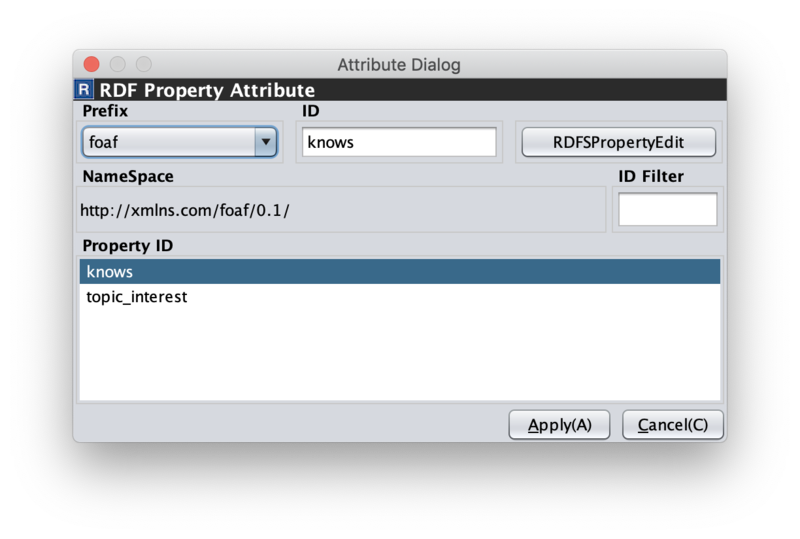 In order to edit an RDF property, the [Attribute Dialog] is used. The [Attribute Dialog] is shown by clicking icon in the toolbar or selecting [Attribute Dialog] menu in the popup menu in the RDF Editor. Fig. 63 shows a screenshot of the [Attribute Dialog] when the users select foaf:knows RDF property. An RDF property can be edited by selecting a prefix from the [Prefix] combobox, selecting an id from [Property ID] list, and selecting [Apply] button. Finally, export the RDF contents as an RDF(S) document. As a result, the following RDFS classes, RDFS properties, and an RDF model are created in each editor (Fig. 64). 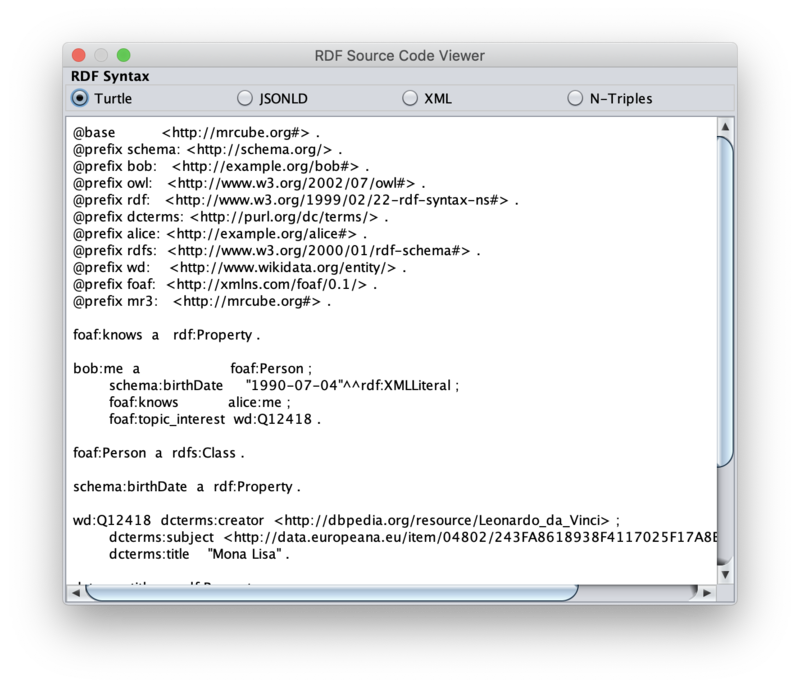 To see how the RDF(S) contents you created is output, show the RDF Source Code Viewer. Fig. 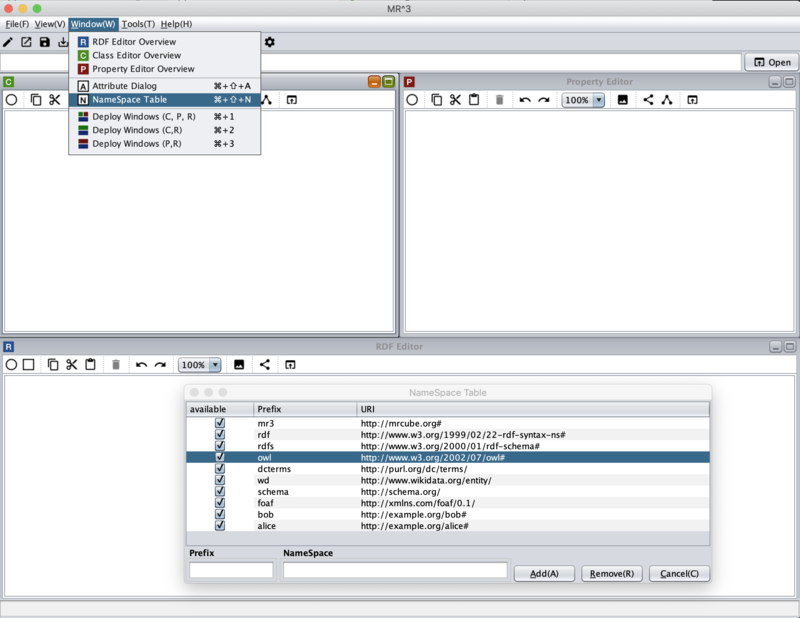 65 shows a screenshot of the RDF Source Code Viewer. The [RDF Source Code Viewer] is shown by clicking icon in the toolbar or selecting [RDF Source Code Viewer] sub menu on the Tools menu. The users can select Turtle, JSONLD, XML, and N-Triples formats as the syntax from the radio button. Selecting the radio button will display the RDF source code with the specified syntax. If the users want to output the created RDF(S) content to a file, select the [Save As] button on the [File] menu. 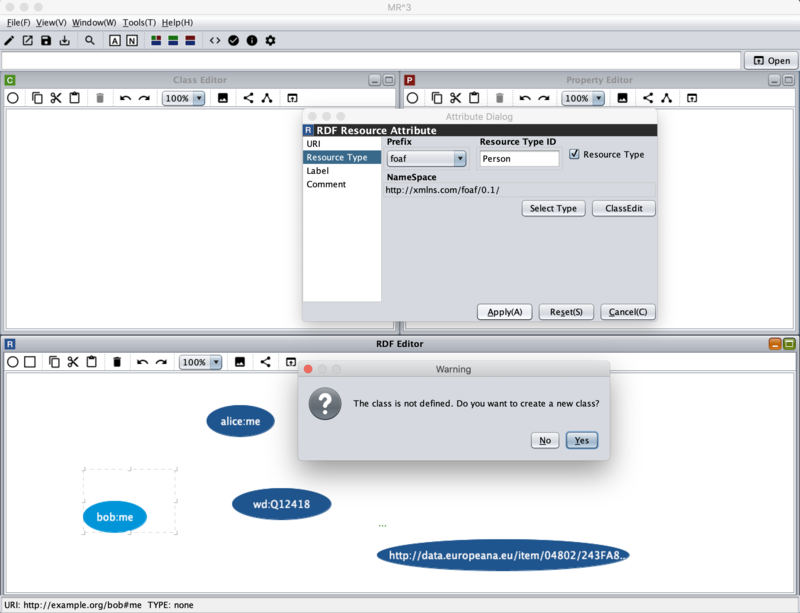 Then, [Save] dialog is shown (Fig. 66). Select the folder the users want to save, select an RDF format from [Files of Type] combobox, and press the [Save] button, the RDF(S) content will be saved to the file in the specified format. 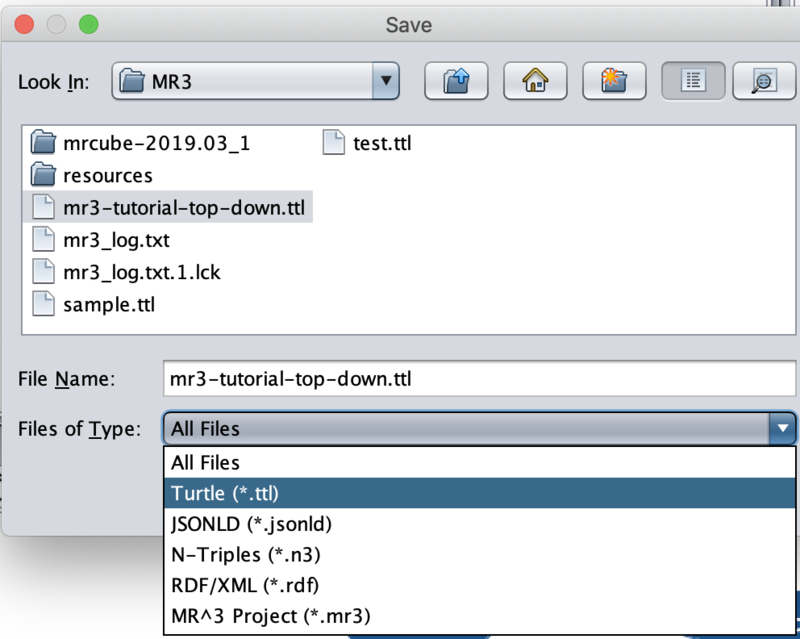 Here, select [Turtle（*.ttl)] to save the RDF(S) content as Turtle format. This step is same as the step1 in the top down method. This step is almost same as the step4 in the top down method. The difference is the type of bob:me resource is not defined in the Class Editor at this time. 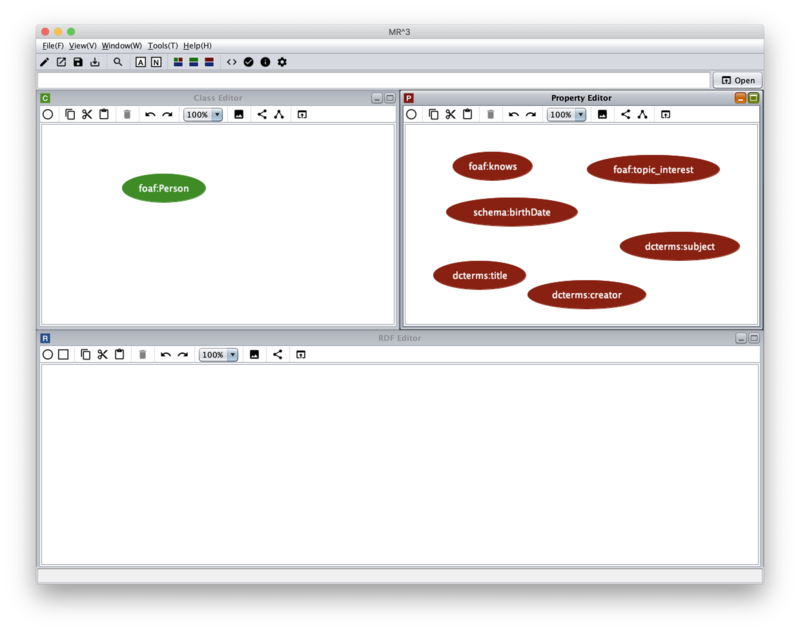 In the bottom up method, the users can create an RDFS class while editing an RDF resource. The attributes of bob:me resource are shown in the [Attribute Dialog] by selecting the resource and showing the [Attribute Dialog]. Then, select [Resource Type] item in the left side list. After that, [Resource Type] checkbox, select foaf from the [Prefix] combobox, and input Person in the [Resource Type ID] text field. 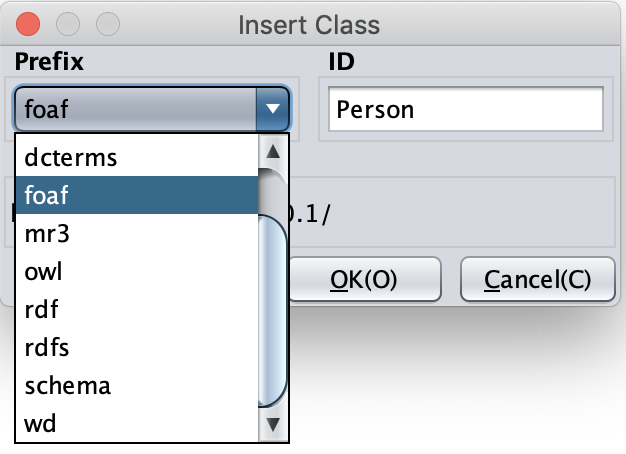 If the selected class is defined in the Class Editor, the selected class can be set as a type of the RDF resource. In this case, since the selected class (foaf:Person) is not defined in the Class Editor, the selected class can not be set as the type of the RDF resource in this state. In this situation, MR3 performs an RDF(S) management facility to maintain consistency. 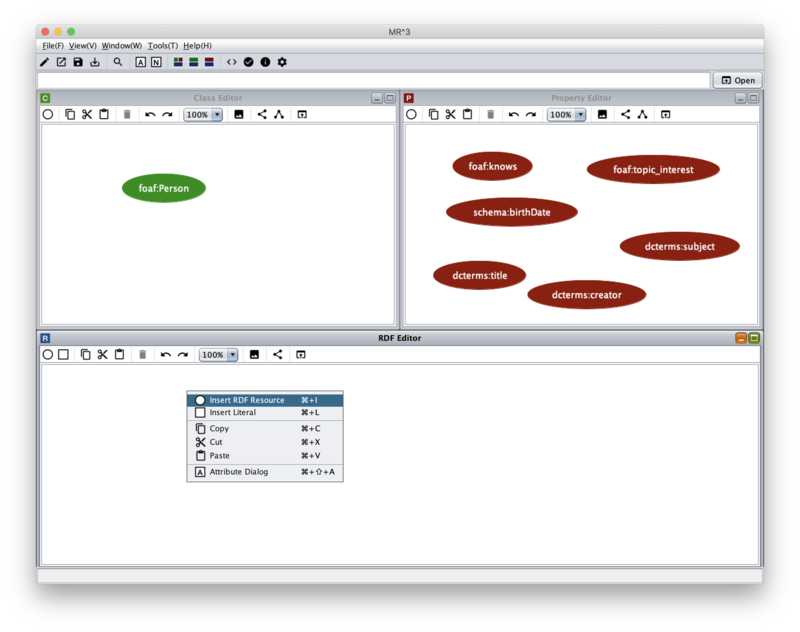 When the users click [Apply] button in the [Attribute Dialog], the [RDF(S) management] dialog is shown (Fig. 67). If the users click the [Yes] button in the [RDF(S) management] dialog, foaf:Person class is created in the Class Editor as shown in Fig. 68. This step is same as the step5 in the top down method. This step is almost same as the step6 in the top down method. The difference is RDFS properties are not defined in the Property Editor at this time. 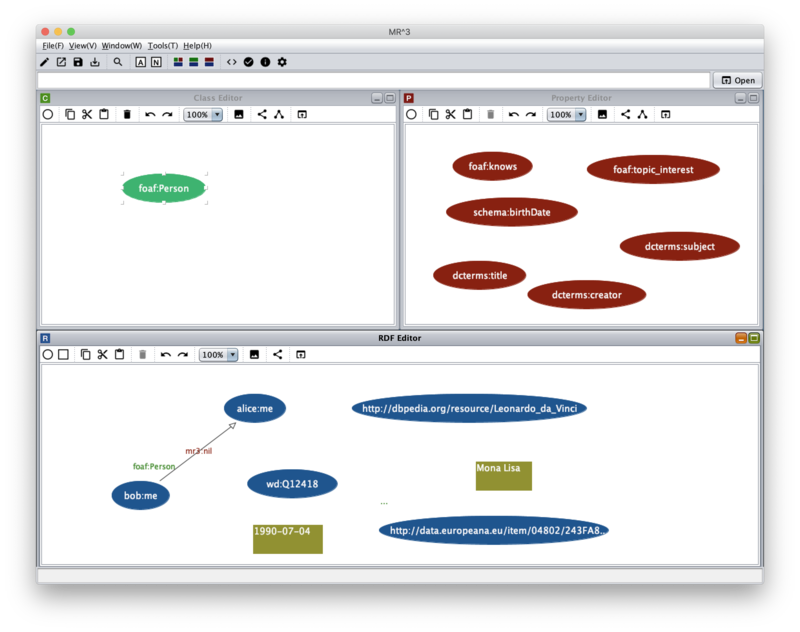 In the bottom up method, the users can create an RDFS property while editing an RDF property. Here, we would like to explain how to create foaf:knows property by the bottom up method. 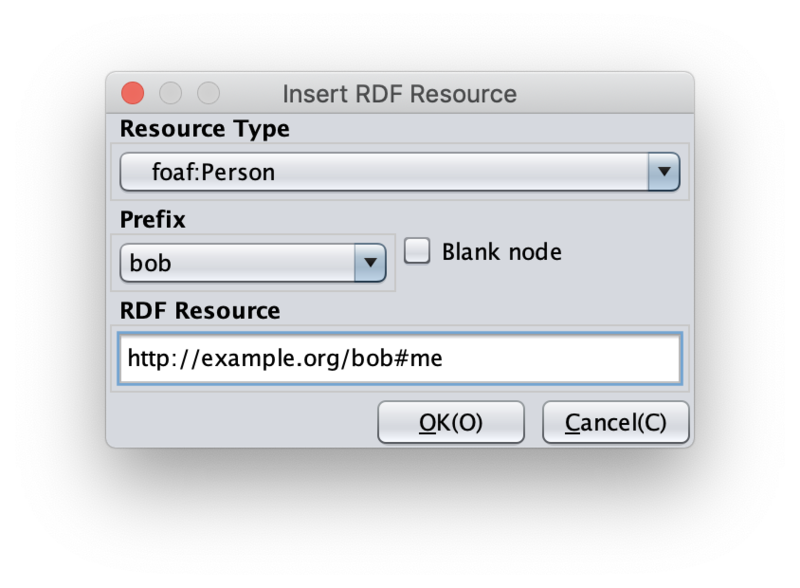 First, select the RDF property which connects bob:me and alice:me RDF resources and show the Attribute Dialog. At this time, the RDF property is mr3:nil property. Then, select foaf prefix in the [Prefix] combobox. Since there are no Ids in the [Property ID] list, input knows in the [ID] text field and click [Apply] button. 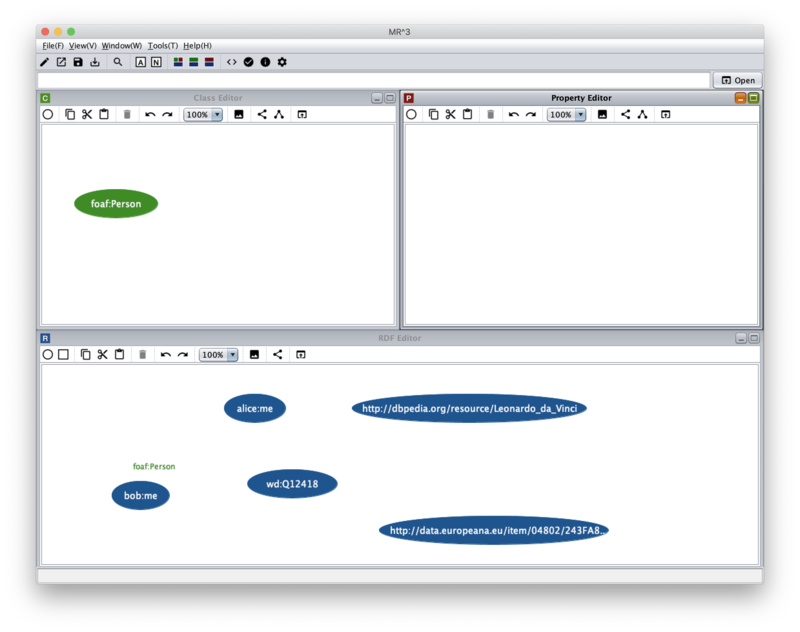 Then, the [RDF(S) management] dialog is shown to maintain the consistency. Fig. 69 shows a screenshot when the users input knows in the [ID] text field and click the [Apply] button. If the users click the [Yes] button in the [RDF(S) management] dialog, foaf:knows property is created in the Property Editor as shown in Fig. 70. Create schema:birthDate, foaf:topic_interest, dcterms:title, dcterms:creator, and dcterms:subject properties in the same way. This step is same as the step7 in the top down method.